Everyone has their own explanation for why they don’t like to see a dentist in Wethersfield. Many can’t get past a frightening incident that happened when they were young. Others just don’t like the sights and sounds in a dentist’s office. And there are some who can’t handle the close quarters in the examination room, or when the dentist and dental assistant are standing so close. No matter why you’re frightened, sedation dentistry will soothe your anxiety. Who Else Benefits from Sedation Dentistry? If your nerves are only mildly upset at the dentist, then nitrous oxide could be the perfect solution. 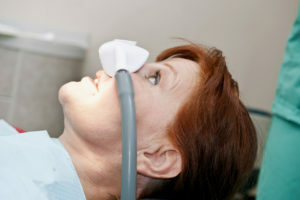 Also called laughing gas, this form of sedation is delivered through a nose mask during your procedure. As you breathe in the measured combination of oxygen and nitrous oxide, your body will relax and worries will slip away. Once the mask is removed, the affects wear off quickly. For moderate dental anxiety there is oral conscious sedation. With this, the dentist prescribes a small dose of a sedative that you take before coming to the office. As the sedative goes to work, you’ll begin to feel a bit drowsy and much more relaxed. Because of this, you will need a family member or close friend to drive you to and from your appointment. After your appointment, the sedative may cause you to forget your treatment. Therefore, you may think that you were asleep. However, you remain awake and the dentist and assistant even talk to you. Overcome your fear of the dentist with either nitrous oxide or oral conscious sedation. Contact a dentist in Wethersfield to schedule an appointment. Drs. Thomas and Brendan Dolan are a father-son team of dentists who take pride in providing high-quality care to their patients. With this in mind, they offer sedation dentistry for almost any type of procedure. They currently practice at Dolan Dental, and they can be contacted through their website or by phone at (203) 427-0868 for any questions.